The involvement in these engines from RGA goes back to 1986 when we brought the first Yaks to the West, and of course soon became involved in engine and engine related issues. 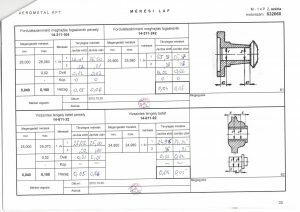 Over a period of time we found that the principal Russian factories –Vedenyev who designed the engines and the Voronezh Mechanical Plant who actually manufactured the engines – were becoming more and more unreliable and difficult to deal with. Fortuitously, some 13 years ago, we were introduced to Aerometal at Soskut, near Budapest. The parent company of Aerometal was established in 1959, with an initial emphasis being on the overhaul of the M14V engines for the Kamov 26 helicopters which were in wide use in Hungary in crop spraying. Now that all the original Russian overhaul factories have effectively disappeared, Aerometal is now significantly the oldest established business in this world of these Russian radial engines. When Hungary joined the EU, the crop spraying activities were investigated by EU agricultural specialists, who were unhappy about the sorts of Soviet chemicals that were being used, and stopped much of the business. We came to an agreement with Aerometal to replace all their helicopter engine business with fixed wing engine business, and this relationship has continued extremely successfully. 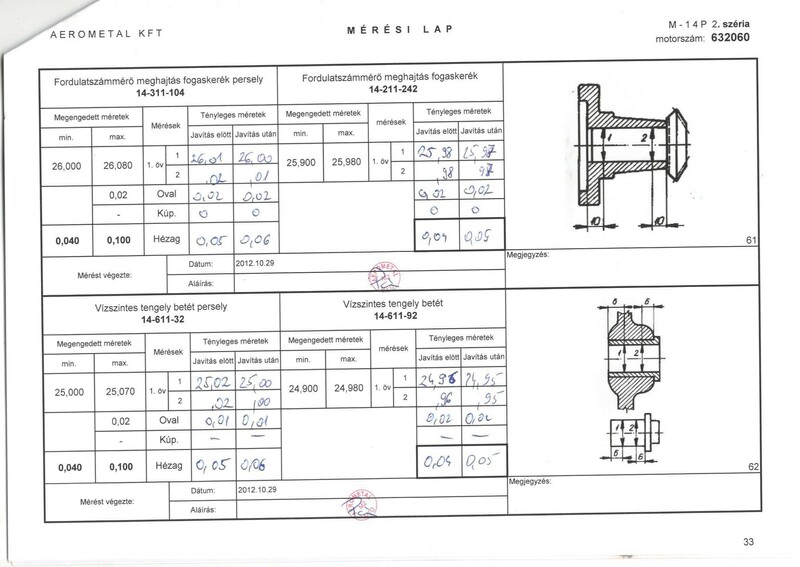 As one of very few companies in Eastern Europe who were authorised to perform total overhauls to zero-time condition on these engines, Aerometal have all original Russian archive material – for example over 2000 pages just for the M 14 P. These list every facet of the overhaul procedure, and also all dimensional requirements for every single part and component. 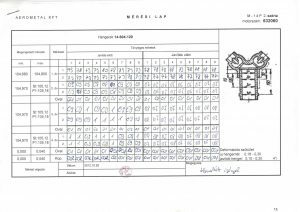 At the bottom of this page you can see two sample pages (out of 162) covering every aspect of the engine analysis, indicating the dimensions that need to be measured and the tolerances that are allowed. As you will have read above they are the oldest established, and also significantly the largest business in this world of these Russian engines. The combined experience of their specialist technicians is over 120 years – unmatched anywhere else. Aerometal is a self-contained business, and in addition to the engine workshops, they also have a very sophisticated machine shop; a fabrication area; an anodising and plating workshop and a painting facility. In effect, all work is done in-house. 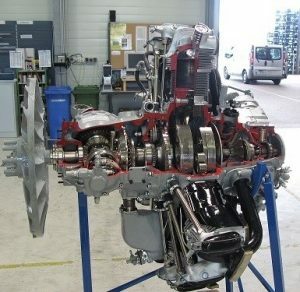 Aerometal is the only company in the world who are fully authorised by EASA (who control all aviation issues within Europe) to overhaul these engines and to issue an EASA “form1” which is the highest European qualification for an aviation product. Every part of the engine is totally overhauled, including all ancillaries, and even including the engine mounting ring. Each ancillary receives its own EASA “form 1” document confirming that it is technically perfect. Aerometal have massive stocks of new spare parts which have been deliberately built up over the years, so do not have to resort to “making do” with somewhat worn parts. Through considerable experience with these engines, Aerometal assemble their engines to tighter tolerances, particularly in the supercharger area than originally recommended, which results in better engines that are more powerful and more economical. We expect our engines to develop an additional 25 hp over the nominal output for that type of engine. It should be noted that the expected Russian horsepower outputs are always “-2%”, so a nominal 360 hp engine can be as little as 353 hp. Importantly all our engines are tested on a precise dynamometer, which has been calibrated for an accuracy of 0.1%, and the actual results of each engine are given to the customer of that engine. We automatically replace around 150 parts where replacement is considered to be mandatory. Whereas other overhaulers of these engines will typically only install new piston rings, we always insist on fitting complete new pistons, and of course this includes new piston rings/piston pins and piston plugs. We fit the latest SPC pistons which have three high-technology piston rings rather than the five heavy and low-technology standard rings. These result in oil consumption being reduced by approximately 40%; less plug-fouling; more power; cooler running. We have full authorisation to install these pistons and give the engines an EASA “form one”. We can also provide the excellent American Barrett pistons, which are made from a completely new aluminium which expands at precisely the same rate as the cylinders, so it can be made with a tight fit when cold but ensuring no problem when hot. These reduce oil consumption to approximately 1 L in 2.5 hours; the engine runs far cooler; they virtually eliminate plug-fouling; easier starting and are available in a high compression version, which adds a typical 25 hp to an engine’s output. Each engine is balanced to a factor that is three times as good as allowed in the original Russian documentation. We place considerable emphasis on engines that are finished to a lovely cosmetic standard. The principal parts of the engine are finished in the colour of the customer’s choice, and all exposed metal parts are either plated or anodised. Indeed there is a possibility to “colour-match” some of the anodised parts if a customer wishes. We typically include our excellent automotive spark-plug conversion kit, for which we have obtained full EASA approval, with each engine. Each engine is fully tested for a minimum of three hours on a proper dynamometer (unlike being mounted on an old airframe like others do), and all engine parameters are recorded and then passed to our customer. Unless an engine is needed for immediate use, they are conserved for long-term storage. With each engine we supply additional suction and acceleration jets for the carburettor so it can be precisely “tuned” after installation. We genuinely believe that our engines from Aerometal are not only the best in the World, but significantly better than when they were in new production! Our business is split into two areas – the overhaul of engines for customers, and the supply of totally zero-timed engines for the growing market of constructors building aircraft using engines in the M 14 family. 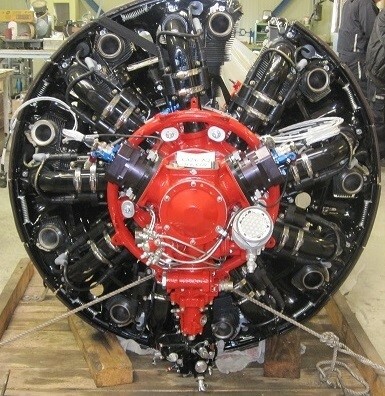 Historically we kept stocks of engines for immediate delivery, but increasingly our ability to provide “special” engines for our customers has made this more and more difficult, in that we cater for customers who want different propeller shafts; special colours; PF superchargers; different pistons (see below) et cetera. For this reason, every engine is handbuilt for a specific customer. We have large stocks of engines which are waiting for overhaul, which enables us to accept an order for future delivery; prepare the precise engine that is needed; deliver the engine, and then receive the customer’s old engine when it has been removed. A choice of Russian or SAE propeller shafts – we supply either at the same price. Installation of “PF” superchargers, the original Russian design of which was funded by us, and which we feel are a distinct advantage, purely apart from the additional 40 hp that they give. Installation of the superb electronic ignition which we offer, which overcomes the problems of the very “old-technology” magnetos. 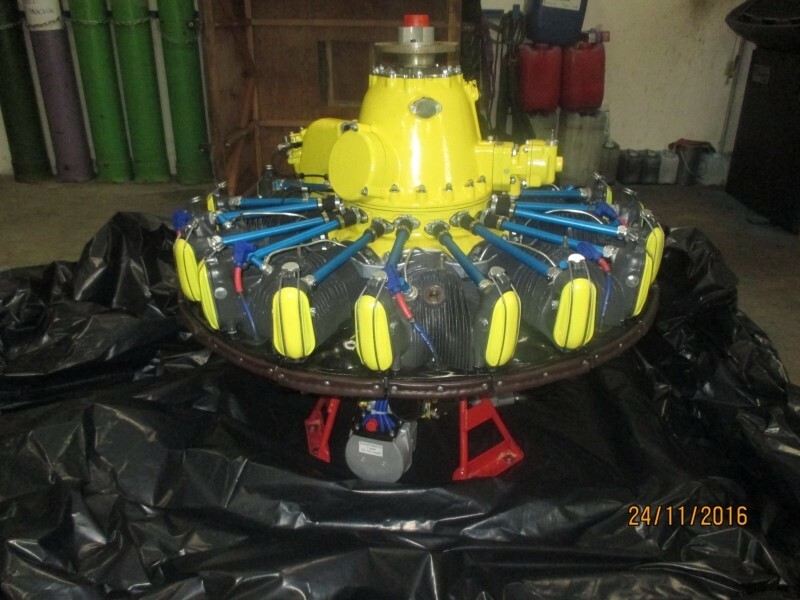 Installation of lightweight alternators, together with their voltage-controllers. 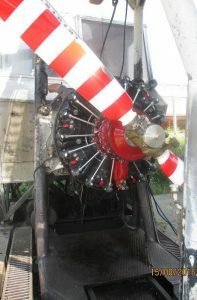 Provision of electric-start engines – which are increasingly popular, although historically, all these engines would operate with air-start. We are able to provide a complete range of engines from a standard AI 14 RA engine, which from us typically gives just over 280 hp, up to an M 14 PF with special assembly; Barrett Pistons and electronic ignition from which we expect a reliable 450 hp on the dynamometer. Micro-polishing is a specialised treatment of gears in which the surface of the gear is very carefully polished in the areas that it is meshing with another gear which can significantly reduce friction, and therefore release more power and reduce temperatures. 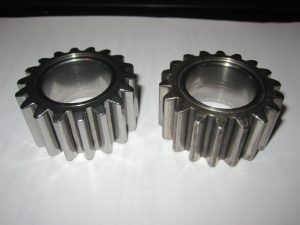 We did extensive research on this, working with the well-known UK producer of automotive competition gearboxes, Hewland, and decided that there were nine specific gears which would benefit from this treatment. The first are the three supercharger drive gears, which, in PF specification turn at some 30,000 rpm. The second is in the gearbox the front of the engine, where there is an epicyclic gearbox, transmitting all the power of the engine. Here we micropolish the six satellite gears. It is difficult to precisely quantify the benefits, but we estimate that micropolishing will produce an additional 7/9 hp, and reduce oil temperature by 7/10°C. We charge an additional €550 for this service. Please see “Engines for Sale” for our prices. Overhauls are priced according to the engine, but essentially cover every aspect of the overhaul, with the exception of any parts that might be damaged through overheating; hydraulic lock or whatever. 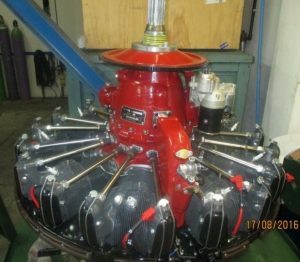 We are also able to supply, typically on an exchange basis, all ancillary items, all completely overhauled with “form1” such as magnetos; carburetors; governors; compressors; fuel and oil pumps et cetera. In addition we supply complete “PF” supercharger and accessory case conversions which can be simply fitted to an existing engine. 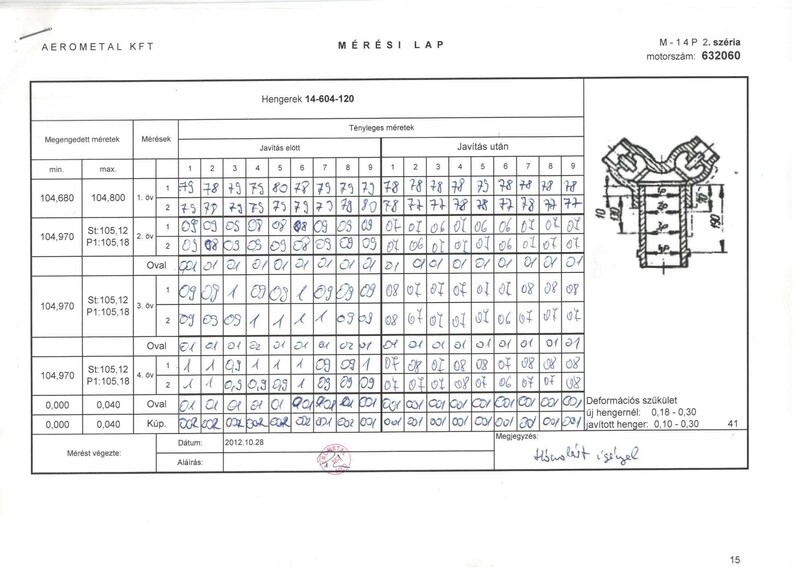 An acceptance report on engine arrival, which is typically done within three days, which will describe the engine; any missing parts or other obvious problems. Total disassembly, followed by removal of all paint and complete cleaning of every component. Testing and examination of every component, whether by measuring; x-ray; crack-testing to check for those that should be rejected or retained. You can see below two sample pages of the 121 pages, showing the actual dimensions established during examination of an actual engine, against the required dimensions. Sourcing of all new parts and components that will be required. Detailed processes such as honing the cylinders; grinding the valves; manufacture of new bushings et cetera. All this is done in-house. Painting of all components in the appropriate colour; plating or anodising of other parts, again in-house. Assembly of the entire engine. Testing on the dynamometer with recording all results, which are given to our customers. Rechecking valve clearances; magneto timing et cetera. Conservation and then packing. For airfreight we have developed our own lightweight, but strong, crates which are also made from treated wood, and therefore are acceptable to the authorities in countries like such as USA and Australia. We have excellent contacts and are able to ship engines by road within Europe and by air anywhere in the world.